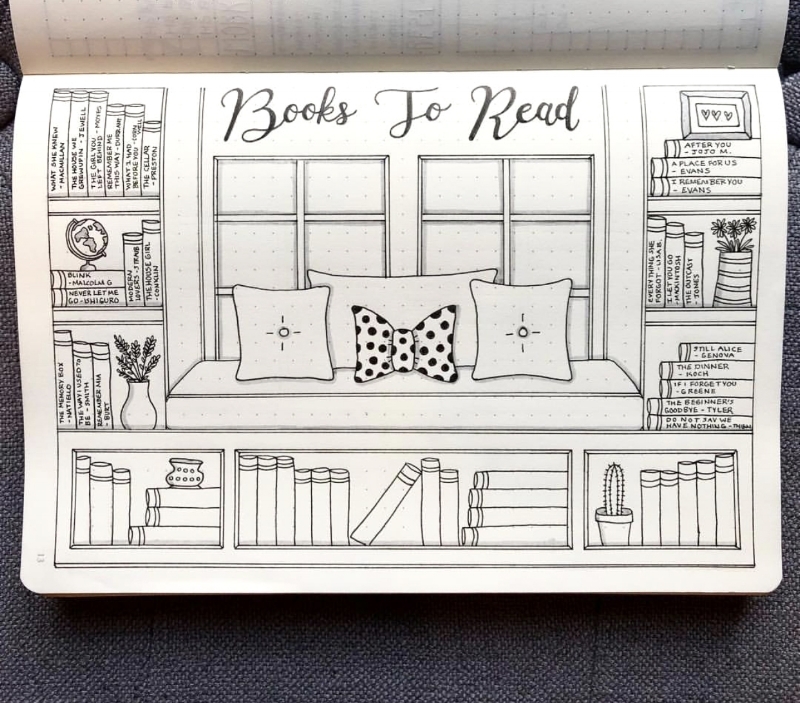 Nicole Barlettano is the designer, illustrator, and bullet journalist behind PlansThatBlossom, a bullet journaling Instagram that has built a loyal following over the past 2 years. Bullet Journaling (BuJo, for short) is a system of logging day to day habits, activities, and goals determined by the journalist in an effort to stay organized and aware of their daily habits. 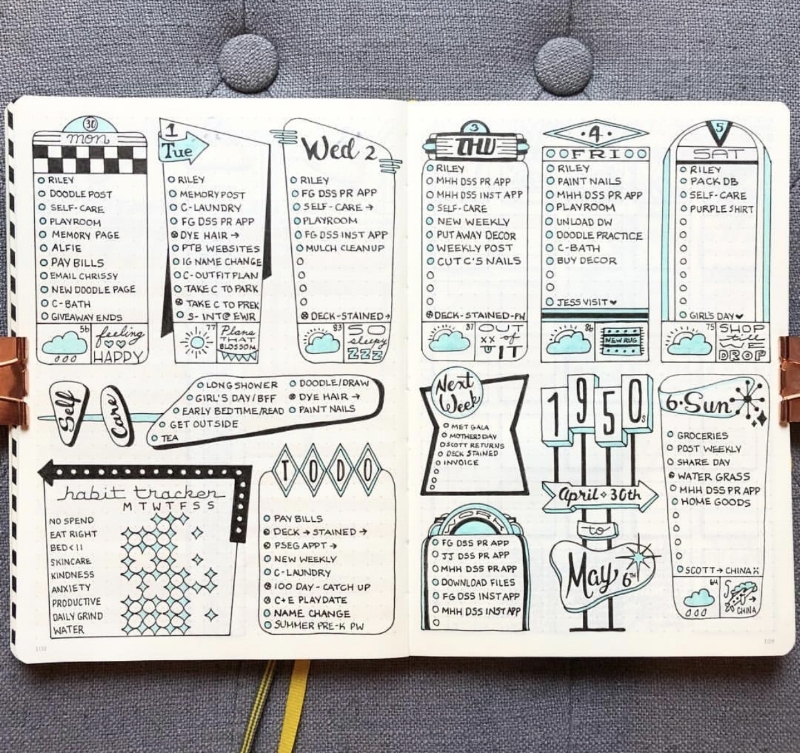 Developed by designer Ryder Carroll as a system of “rapid logging”, it has developed a massive following of devoted journalists who add their own artistic flair to their journal spreads. Nicole’s spreads feature a mixture of hand-lettered typography, decorative frames, and sometimes even full scenes that make each page a little work of art. Nicole finished her first sketchbook with our project in 2014, and is currently working on her submission for our Tiny Sketchbook Project. We were able to chat with her about her process, what to do when you feel stuck, and how a bullet journal differs from a sketchbook. What is your process for planning out a spread in your journal? This really depends on the type of page or spread I'm creating. If it's a simple weekly spread, I build it based on my needs or tasks for the week. If the spread is something a little more artistic, then I try to take something ordinary and think about how I can make it functional. The results often surprise me! What does keeping a journal or sketchbook mean to you? Keeping a journal and a sketchbook means everything to me! A journal or sketchbook can be so much more than just a hobby. It becomes a time capsule, a diary, and a way to challenge yourself. 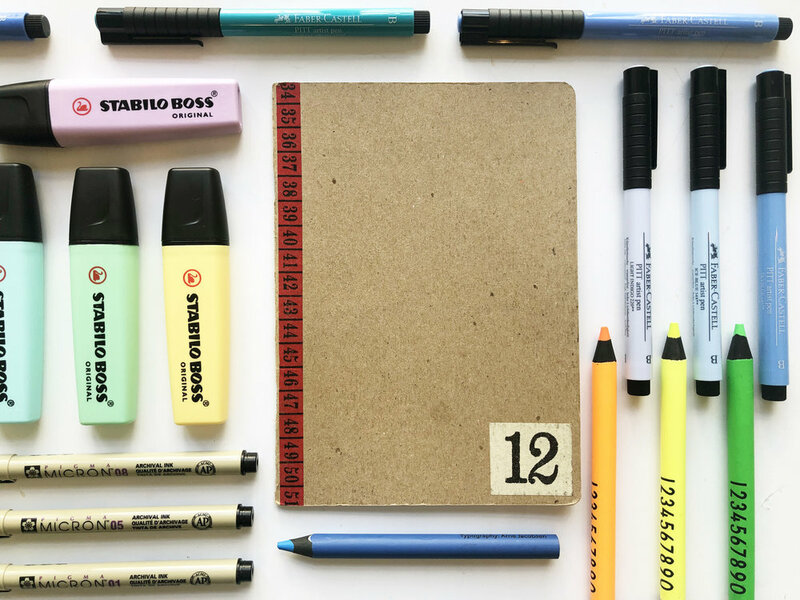 How does your bullet journaling overlap or correspond with your design work? It definitely overlaps! I find that the 2 go hand in hand, and it's really fun to create my illustrations digitally, as well as creating my designs manually with pen and paper. There is something so satisfying about holding a pen in your hand and not having the opportunity to "undo" your mistakes. It allows me to embrace my imperfections, which can sometimes be challenging. Aside from that, the obvious overlap comes with design elements such as different fonts, shadows, layouts etc. You create a lot of templates and tutorials to help people with their journals. What do you think is the hardest part about starting a bullet journal? I think the hardest part is that it can be an overwhelming hobby when you're on the outside looking in. We put a lot of pressure on ourselves to be perfect, and to dive into our interests fully. I think it's best to take this hobby step by step and see what works best for you. That's the beauty of this system (created by Ryder Carroll) - you are able to customize it for your lifestyle. I would suggest starting small, and then adding artistic touches after. I love creating tutorials! I think breaking down a complex shape into simple ones allows people to see that they are fully capable of creating something fun and unique! Sketchbooks can feel very personal and private - I imagine a bullet journal can feel the same way, as you are tracking the day to day of your personal life. Is it hard to share your work in such a public way, and how do you overcome that? Quite honestly, it is very difficult. I receive a lot of questions about my personal life, which can be challenging to answer. I used to blur out certain entries or appointments, but it became such a hassle. In the last year or so, I've built a shorthand of sorts for myself so I know what certain things mean, but others don't. It helps me be transparent but not 100% public. I want my followers to see that I'm a real person, and that I actually use the spreads I create - that's very important to me. A bullet journal needs to be functional above all else. Every creative person has days where they lose their inspiration. What do you do when you feel you’ve hit a creative block? Artist block hits pretty hard every few months or so, and I find that the best way to beat it, is to just step back and take a break. When I try to force myself to be creative, I never end up liking the result. Aside from that, for daily inspiration - I can find it everywhere, but I love seeing what others in the bullet journaling community create. They are such a kind and talented group of individuals. I'm so lucky to be a part of it! What was your experience like creating a sketchbook for the Sketchbook Project? How did it differ from the work that you do now with your bullet journals, if at all? When I discovered the sketchbook project (many years ago!) I became obsessed. I loved the idea of choosing one of your unique themes and an empty sketchbook full of possibilities. It brought me back to being in art school and getting a project that I couldn't wait to dive into, except with this, everything is up to the person creating it. I love it, and have been enjoying the tiny sketchbook project so much! It gives me the challenge of drawing small, which I love to do! I think that bullet journaling and the sketchbook project are as similar as they are different. It's similar in the sense that you can be creative and are given the opportunity to show your work to others. They both have a hand in self exploration as well, which can be so rewarding. They are different in that one is a productive tool that needs structure, while the other can be completely open ended. I love both, and look forward to continuing both in the future.